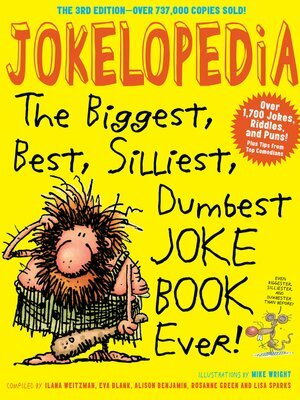 The Biggest, Best, Silliest, Dumbest Joke Book Ever! It's the mother of all kids' joke books—an all-encompassing, gut-busting, and bestselling collection of more than 1,700 jokes, tongue-twisters, riddles, and puns for all occasions. Here are 61 elephant jokes, including: What did the elephant say when he walked into the post office? / Ouch! Dozens of knock-knock jokes, like: Knock-knock. / Who's there? / Doris. / Doris who? / Doris locked. That's why I knocked! Plus teacher jokes and creature jokes, doctor jokes and robber jokes, food jokes, gross jokes, why-did-the-chicken-cross-the-road jokes, and name-game jokes: What do you call a man in a tiger's cage? / Claude. And for all aspiring comedians, there are joke-telling pointers and tips, funny facts, and spotlights on comic TV shows, books, and actors, from Steve Carell to Tina Fey to SpongeBob Squarepants. It's the ultimate gift for the incurable jokester. Alison Benjamin is a recent grown-up with fond memories of being the class clown. Rosanne Green is a recent grown-up with fond memories of being the class clown. Eva Blank is a recent grown-up with fond memories of being the class clown.